This incredible Movie Replica features an almost 'parachute' like opening that catches the wind beautifully if left unbuttoned. 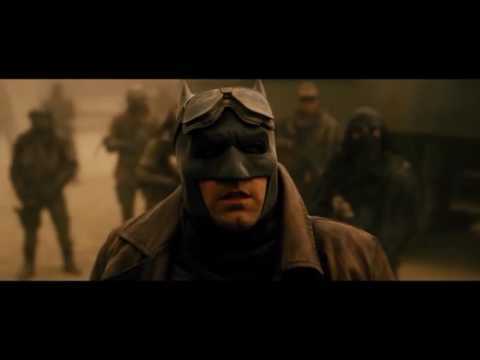 Every cut, element and accessory has been faithfully replicated to what was seen on screen during that apocalyptic - parallel world vision by Bruce Wayne. Soft, luxurious Sheep Skin Leather. Need more details on our other Batman DOJ - Movie Replica Leather goods and accessories? Click the IMAGE BELOW for product info. NOTE: Add 1 Inch to YOUR chest and waist MEASUREMENTS. Then compare those NEW measurements to the Trench Coat Chart for proper Coat size. 57" 57" 58" 58" 59" 59" 59"
20" 20.5" 21" 21.5" 22" 22.5" 23"
22½" 23" 23½" 24" 24½" 25" 25½"
For the DOJ Batman: Utility Pouch to fit OVER one of our Batman Jackets, ALWAYS ORDER ONE SIZE SMALLER UTILITY POUCH compared to your Jacket size.